There’s bad news, though. Because our teeth are the result of evolution, they are only really ‘designed’ to last us until we naturally stop reproducing – 50 years, tops. And these days we live many decades longer than that. So unless we have been extremely careful with our teeth throughout our lives, we’re only going to hang on to our them with increasing assistance from the dentist! 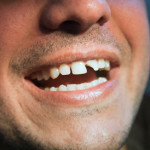 And for most of us, lost teeth can take a big toll on our health, finances, and overall well-being. Prosthetic means of replacing missing or lost teeth began centuries ago – there’s even evidence that the ancient Egyptians used a form of dental implant, and George Washington famously had wooden false teeth. Dentures can be unstable, and need frequent relining to maintain fit as the profile of the gum on which they rest changes. 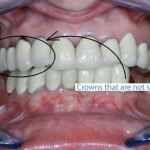 Bridges rely for support on the continued health of the adjacent teeth. But if the lost tooth failed due to gum disease, as is often the case, it’s highly likely that the adjacent teeth are NOT entirely healthy. If so, the life of the entire structure will be compromised. Lastly, but most importantly for our discussion, neither of these solutions preserve the bone around the site of the lost tooth. Bone loss following tooth loss. Bone is living tissue. Strange though it may seem, it is constantly being regenerated. But, just as children’s bones are strengthened by the knocks they receive playing contact sports, so our jaw bones need the stimulus of chewing and biting to maintain the complex, cup-like bony structure around the teeth. 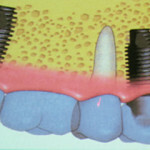 When we lose a tooth, that stimulus is lost, and the bone will begin to ‘resorb’. This is why wearers of a full removable denture are forever having them relined – their jaws are literally dropping! Although early attempts to implant prosthetic structures in the site of lost teeth had been made (remember those Egyptians? ), they had enjoyed limited success, because the materials used had not integrated into the patient’s tissue, increasing the strength of the restoration and sealing the site against infection. In the 1970s, however, an orthopaedic surgeon noticed that when he used Titanium pins and screws to provide temporary fixture for fractured bones, they were far more difficult to remove than similar items made from other alloys and metals. Bone, it seems, loves Titanium, and will grow rapidly around it. 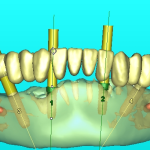 Dentists call this process integration, or “osseointegration”, and it lies at the heart of the dental implant revolution. Soon, dentists were placing titanium bolts into the site of lost teeth, and mounting an otherwise conventional crown on top. 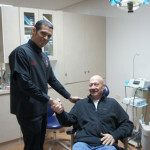 An exciting and lasting alternative to “false teeth” had arrived! Since those early days research and development has led to a staggering variety of implant applications, implant design and surgical procedures.